We at Schmooze have been asked about providing a reseller program for FreePBX and our FreePBX Commercial modules for as long as we have offered them. We are now happy to announce the creation of the Schmooze Certified Reseller program. 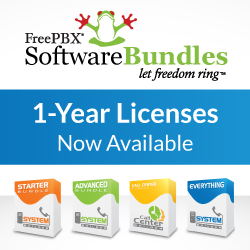 Since FreePBX primarily competes against legacy PBX products, when creating this new Reseller program we wanted to ensure that Certified Resellers would have the required training and knowledge to build and be the first line of support for Certified FreePBX systems for their clients. This meant changing our Reseller Program to now require Classroom Training and Certification Testing for companies wanting to be Schmooze resellers. New Schmooze Resellers will need to complete classroom training & certification within 120 days of signing up to be a reseller. Existing PBXact resellers will be notified of the new Certification Requirements for their particular situation. Upcoming Classes are being offered May 21-24, 2013 in Huntsville, Alabama at the Digium Headquarters, and in Phoenix, Arizona in July or August. Becoming a Schmooze Reseller is your first step to success! Whether you are looking for the support, time and cost savings of a commercially branded PBX platform ready to hang on a wall or prefer to build each system from scratch using the open source FreePBX Distro The Schmooze Certified reseller program will fit your needs. MarketPlace Member– Gives you access to the entire FreePBX Product Line, including Appliances, Commercial Modules, Software Add Ons, Paid Support, Classroom Training & SIP Trunking. Register Now. Free to all and has no requirements. Schmooze Certified Reseller- As a Schmooze Certified Reseller you can adjust the program to fit how you do business, selling the Schmooze solution that best addresses your clients needs solutions based on the FreePBX Distro or PBXact a commercially supported PBX platform. Continue Reading or Apply Now. Conference Calls & Webinars with the Project Managers & Developers. The process to become a Schmooze Certified Reseller is simple, but thorough. You may contact one of our Channel Partner Managers for assistance or you may follow the instructions below to complete the online application form. Complete the online application, including submission of all requested documents. Upon Approval you will be sent an electronic reseller agreement to sign and return. After accepting the reseller agreement you will be sent login information for the Schmooze portal and our other online resources where you can find support tools, product online quotes, and purchase hardware, services and support. Once you complete the Certification Process your portal profile will be adjusted to include additional discounts, as well as receive Sales Leads within the markets you serve. Turnkey Hosted PBX Platform– we provide and support a rock solid commercially supported hosted PBX platform within your own infrastructure, greatly reducing the development and ongoing support cost of implementing a hosted PBX solution, while enabling best in class PBX features and the ease of provisioning from a web interface. The Turnkey platform enables you to get a kick start on adding hosted PBX platform to you company’s portfolio. Read More Info Here. Custom OEM Program– This unique program allows you to get a fully supported skinned version of the FreePBX Distro customized with your company’s branding and suitable for use on both premise hardware as well as your own hosted environment. Read More Info Here. Entities wishing to distribute Schmooze Products outside of North America. Please Contact Us Here.